This Friday Quick Tip is an expansion on an earlier tip to help you paint nice, clean lines without any stress. After a few requests, here is a more detailed procedure. The key to this tip is gouache. 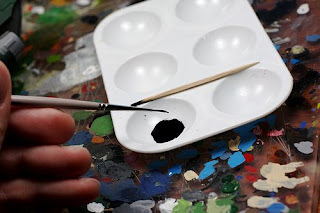 The acrylic paint I normally use is made up of three things: pigment, solvent and binder. Pigment is the color, solvent is the thing that keeps it liquid in the pot and the binder is acrylic that keeps the pigment together once dry. 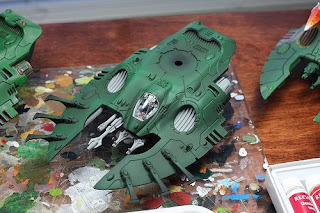 When the acrylic paint dries, you are left with pigment infused plastic. But gouache is different since there is no binder- just water and pigment. It dries really flat and loses a little saturation, but since there is no binder you can get it wet again and move the pigment around. 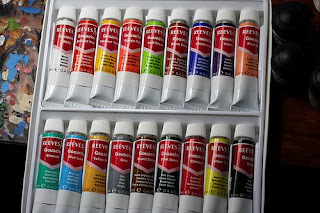 The best part is that gouache comes in a variety of colors, is available at most art stores and is pretty cheap. I got a big set from the sale table at Michael's for less than $10. 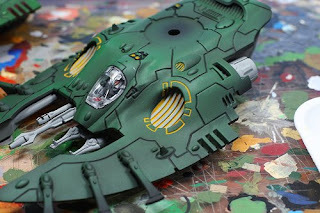 The basic overview for this technique is that you will lazily paint the gouache into the lines of the tank, and then pick up the excess with a damp Q-tip to make the lines neat and tidy. It comes out of the tube almost like a paste, so I squeeze out a little bit and add some water. Gouache is kinda gritty and chunky, so mix it well with the toothpick (NOT the brush!) until you get a nice, even consistency. I recommend a liner for this. You can use a small detail round brush, but it isn't going to hold a lot of paint and it is going to make painting in the lines harder. Make sure you don't overload the brush so there's a drop at the end-- that will make your lines blobby and just create more work for you later. Be sure to make sure you also don't pick up a chunk of pigment. If you don't mix it well you can get clumps. Then just throw it on, being as neat as you can, but don't worry if you make a mistake. 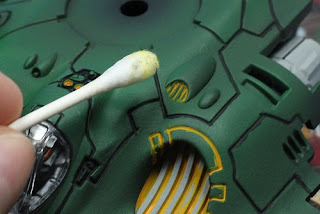 Once you have the paint in all of the armor plate lines, you'll want to remove the spots you missed and clean things up a bit. Get a whole bunch of Q-tips and a big glass of water. For a Falcon-sized tank, and if you've been pretty neat with your lining, you'll need about 35 Q-tips. 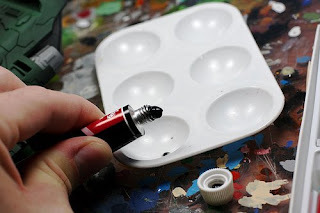 I've found that dipping the Q-tip in water makes it much too wet, as you only want a damp Q-tip to pick up the excess gouache. If you use too much water, it will reactivate the gouache and a big mess will start to run down your model. I just moisten the Q-tip in my mouth and apply it to the model, turning it as I move along a line. You always want to use a clean part of the Q-tip and NEVER lick a Q-tip that has touched gouache. DO NOT EAT THE ART SUPPLIES. If you use a dirty Q-tip, you'll make a big smear, so be careful to rotate it as you remove the excess and don't do too much at a time. This Q-tip is dirty, so get a new one. Make sure you have a place to put the dirty, wet Q-tips like a plastic trashbag. Also, a tall glass of water will keep you from getting dry after sticking a lot of dry cotton Q-tips in your mouth. Once you get the excess gouache wiped away, you are left with some nice, clean lines. 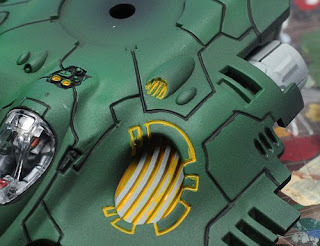 Any tips or techniques you'd like to see in more detail or done as a step-by-step tutorial? Wow... I always thought people used washes and inks... this seems like a much better idea though. A question; do you put a dull cote over this or any type of varnish? It seems that if you got any person with greasy/ sweaty fingers that touched this the gouache would run and drip and be all messy, your solution? Tabletop quality Orks for Sale. Plenty of converted vehicles. Moving and don't want. PM for details. I've got a few tanks that are unprotected and the gouache last a while with normal gaming and handling. Maybe a year or more, depending on how much you play. Luckily it is easy to just touch up a few spots if you need it. Since it is in the cracks of the tanks it really doesn't get messy, but I haven't spilled water on it or anything like that. As long as you use an oil-based spray, you shouldn't have any trouble doing a protective coat. As with anything you aren't certain about, give it a run on a test piece to see the effect before you use it on a big project!